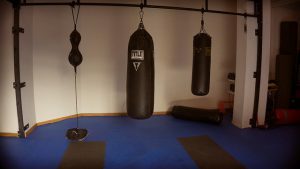 Heavy bags are used for decades and there are a lot of reasons why we see them in every gym today. With that, people tend to buy a heavy bag without filler, in that way it is cheaper. There are some filling materials which are preferred more and each one of them gives different experiences, different results. Most commonly used materials are fabric, sand and water. In this content, you will find which materials are more suitable for you and also how to fill a heavy bag with them. Fabric is the second best material for not having hard or soft spots even after years. You can use old clothes and cu t them into little pieces. Distribution will become quite well after 3-4 training sessions and you will start having good striking experience. How to fill a punching bag with fabric and how to make it heavier and tougher? After you find lots of old clothes, cut them in pieces. Then, place a sand bag in the bottom center of the punching bag, then surround it with cloth pieces. Also, put fabrics on placed sand bags as well. Continue placing sand bags to the center every foot and surround it with cloth pieces. As you do it, squeeze fabrics with some kind of weight. Stuff like baseball bat can be ideal for it. In that way, the distribution will be better. Important note: When you cut old clothes in pieces, make sure that there are no buttons, metals, zippers… Simply get rid of all materials which are not fabric. Some bags are used for low kicks and knee strikes. These are generally Muay Thai, MMA heavy bags and taller than boxing bags. Some companies use cylindrical support to have better stability for these bags. They place it at the center of the punching bag. If you want to do that, according to height of the heavy bag you can cut cylindrical PVC and place it to center. Then, continue stuffing fabrics to the bag and squeeze these with some weights. I have been quite active for helping boxing and regular gyms, sometimes I worked halftime as a trainer. 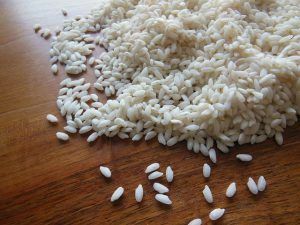 I saw that when rice is used for filling a heavy bag, it affects inside material of the bag and these punching bags last less than normal. I remember we had used a heavy bag filled with rice only for 5 months. At the end of five months, its cover material had lots of defects. I actually could not find any explanation for it, however, even companies don’t say “can be filled with rice”. They used to a decade ago but now they don’t. There are lots of heavy bags which can be filled with either water or sand. Water gives “more natural” striking experience and you can fill the bag very easy with it. However, if you want heavier and tougher bag, then sand is just for you. With that, you should always train with hand wraps and boxing gloves to protect your hands and get the best punching experience at the same time. You can have more information about it on heavy bag gloves and their features. If you think of filling with sand, make sure that your bag can be filled with sand. You can generally find this information on the product page of your heavy bag. However, if you can’t find anything, you can leave a comment or e-mail me. Because if it can’t be filled with sand, you will be having problems. For example, there can be harder or softer spots and it destroys the chance of getting a good punching experience, also jeopardizes your health. Another problem is that sand can be settled at the bottom and the bottom can be tough as a concrete. Make sure that you read the explanatory part, so you can avoid these problems. There are some quality heavy bags which you won’t be having these issues ever. If you are interested, check out these good punching bags and their exclusive features. You can also find their warranty information as well. Most quality filler is foam. However, punching bags filled with foam comes filled and these are very durable, some companies even give 10 years warranty for these. I have read and heard people who use rubber mulch as filler. Okay, I have not witnessed it. However, I think it can actually work. Actually, I am quite sure that it can work way better than sand. And again, you have to strike a couple of weeks so it will have good distribution. Keep in mind that all bags have limits like 100 or 130 Ibs, so make sure that you don’t pass the limit. If you do, bag material will stretch and can become totally useless in very short amount of time. Even bags can leak filler material and your place can be a mess in no time. You can just fill the bases of these bags with water or sand. However, the filling parts of these bases are generally very small. You can cut a bottle to half and place upper part of the bottle to the filling part of the base. Then, you can pour water or sand through the bottle easily. Obviously, if you prefer heavier, you can fill it with sand. If it gives too much resistance during training, you can empty it according to your need. I hope you find a suitable method and if you have any questions, experiences related to how to fill a heavy bag especially with rubber mulch, please leave a comment below. I didn’t know that you could use water to fill a punching bag; I know of people that use clothing and rice but not water. And it was helpful to read about what fillers are suitable for the different striking experiences. Each one of these gives different experience with strikes and water gives the most “realistic” experience among them and you can also fill the bag easy with water.